The NFU Mutual Charitable Trust has proudly supported NFYFC for 15 years, enabling members of Young Farmers' Clubs to experience unique travel opportunities, receive expert training and realise their dreams. 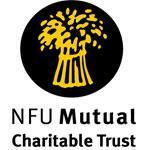 Since 2002, The NFU Mutual Charitable Trust has given nearly a quarter of a million pounds to help young farmers and in the last 12 months more than 1,500 YFC members are expected to benefit from this support. Relieving poverty, assisting agricultural research and advancing education are just some of the other key issues The NFU Mutual Charitable Trust provides for. It has donated £3 million in the last 11 years, supporting communities and helping important initiatives to make a difference in places where it matters. The Prince’s Countryside Fund is also a beneficiary. Its ‘Prince’s Farm Resilience Programme’ provides family farms with free business skills training, a business health check, group workshops and expert advice, to build resilience and help sustain a diverse farming sector in the UK. Applications to take part in the UK wide programme close on 31 October. Look out for details about The NFU Mutual Charitable Trust Centenary Award which provides support for postgraduate students in agriculture. The 2018 award will be launched in January, giving selected students a bursary towards 75% of their course fees. Farms for City Children is another of The NFU Mutual Charitable Trust’s recipients and has received funding for the last five years. It offers urban children from all over the country a unique opportunity to live and work together for a week at a time, on a real farm in the heart of the countryside. In either Devon, Pembrokeshire or Gloucestershire, they can find out where our food comes from and experience how animals are reared. Rural Support based in Cookstown, Northern Ireland, Farming Help Partnership, Royal Highland Education Trust in Scotland, and Wales YFC were among other organisations included in this round of donations.